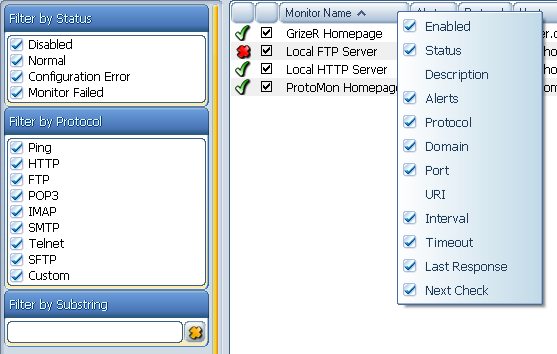 The monitor list shows basic information about the added monitors: name, type, status, last response time, alerts, etc. To view full information about any monitor, select it from the list and switch to the Info panel below the monitor list. Right-click on the list header to display the pop-up menu, which allows you to select the columns to display. Use the check-boxes in the monitor list, to quickly disable or enable the monitors. You can hide some monitors by using the filters panel on the left. The hidden monitors will be processing normally.